Michael Aldrich developed the first online shopping system, he was an innovator who not only realised digital transformation – but did it in a way that was for a social good. Michael had a long association with the University of Brighton – our library carries his name. He was generous with his time (and archives) as well as his money, and I am very glad I met him. 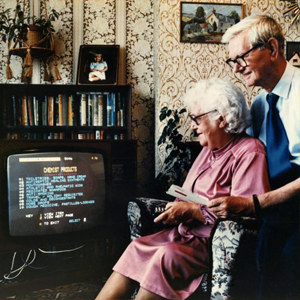 People spend billions each year shopping online, but few know it was a grandmother from Gateshead who pioneered it from her living room.It was an order for margarine, cornflakes and eggs that paved the way for an industry now estimated to be worth £117.6bn ($186.1bn) to the UK economy alone.Grandmother Jane Snowball, 72, sat down in an armchair in her Gateshead home in May 1984, picked up a television remote control and used it to order the groceries from her local supermarket.She was part of a council initiative to help the elderly. What she – and everyone else with her at the time – didn’t realise was that her simple shopping list was arguably the world’s first home online shop…. Aldrich went on to become an information technology adviser to Margaret Thatcher. Tesco became one of the first retailers in the UK to offer a home online shopping service. Mrs Snowball was recognised by Gateshead Council for the part she played in the ground-breaking initiative in a ceremony in 2009. But no-one at the time knew the experiment would actually anticipate a transformation of shopping. Gateshead Council says it has has very few records of the experiment because it didn’t realise how significant it was at the time. It would be another 10 years before retailers would see the potential. “It really was a momentous landmark,” says Rospigliosi.